3-day, tee-to-green instruction makes your swing simpler and more repeatable. You’ll hit better shots, more of them, with improved consistency. Why we teach golf and why that’s important to you. Golf instruction is personalized based on your skill level. Outings are geared to engage both novice and skilled players. We’re here to help. You’ve got questions? We’ve got answers. Heartland Golf Schools conducts its 3-day tee-to-green golf improvement programs at Annbriar Golf Course in Waterloo, Illinois, just 30 minutes south of St. Louis, Missouri. Attending our three day golf school, you give yourself the time to make improvement not achievable from a golf lesson. You’ll receive personalized instruction on putting, chipping, your irons, and your driving. Because we personalized the instruction, both beginning golfers and low handicap players find they make remarkable improvement during their time at Heartland. Beginner, High, Mid, and Low handicap players. Playing better begins here, begins now! Tuition for the three-day school is $795.00. Includes your daily lunch with us at Annbriar’s Smokehouse Restaurant. The remarkable golf instruction you receive makes this an unequalled value. What are the pros and cons of taking hourly lessons vesus attending golf school? While hourly lessons are convenient for fitting golf instruction into a busy schedule, they are not optimal for game improvement. Here’s the drawback. A golf lesson is generally between 30 and 60 minutes. In that time frame a player should only be presented and expected to be able to digest information within a narrow scope.(e.g.. how to improve their setup, better success with bunker shots, or reading a green). Most typically, a lesson will be enough time for such information to be conveyed to the player and the instructor to nudge the player into conforming to the instruction. However, the lesson does not have enough time for the player to practice supervised by the instructor. As a result of the fact that all people forget 50% of what they hear right after they hear it, when you do practice the lesson your result is likely to be less than satisfying–not because of your ability but because of the format of hourly lessons and the absence of extended supervised practice. Attending golf school is different. Rather than breaking golf up into pieces that fit an hourly lesson, you are engaged in an organized curriculum from tee to green. During your full-day sessions, you sense how the blocks of instruction fit together and feel momentum building in your understanding and confidence. Players see improvement almost immediately. With 3 day-long sessions, each block of instruction is then followed by more than an hour of supervised practice. This is critical to ensure that not only have we successfully communicated the instruction and you can implement the instruction but also that you can produce those good shots when you are on the golf course. Bottom Line: Our golf school format of three consecutive days produce opportunities to reinforce improvements and accelerate comprehension and proficiency. You’ll experience more improvement and enthusiasm than you thought possible. How does Heartland Compare with Resort/Vacation Golf Schools? 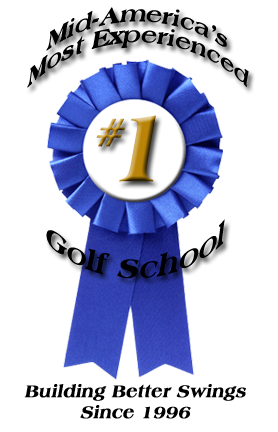 Many resort/vacation golf schools, offer a three day format. The good news about their format is that you are scheduled to play golf each afternoon. The tradeoff is that your game-improvement training is only the first half of each day. Beyond the matter of only getting half-day training sessions, we believe that while following each of these half-day classes with a round of golf may be appealing, it is asking the player to go out onto the course and choose between practicing new ideas (with which you are only beginning to be comfortable) or setting those new teachings aside to use your existing golf swing. Your three-day format at Heartland has been created as an improvement to that format. While all students enjoy playing golf, we have found that when you choose to attend school your preference is learning instead of playing. Bottom Line: If your interest is in learning to play better, Heartland is a choice devoted solely to improving—all day, each day. How much will I improve as a result of the three days? If the question you are asking is, “How much improvement will I see ‘during’ the three days I am at school”, our experience tells us that players see enough improvement to know that what you are learning works and that what you are learning to do you can do. If the question you are asking is, “How much improvement will I see ‘ in the future’”, our experience tell us that the answer lies in how far in the future and how much time will you have for practice. Upon concluding your three days with us, you will have a new optimism regarding the golf that you can play. However, improvement in your golf, means change and change happens at different rates for different players. One of the drivers of improvement is focused practice. You can accelerate the rate of improvement by elevating your focus and frequency of practice. “Does the piano lesson itself produce a better player or is it understanding the lesson and practicing the instruction received?” Like the piano lesson, your three days will by themselves produce improvement in your game. However, the potential of your time at Heartland will be realized by giving yourself regular opportunities in the three weeks following school to allow the experience to be reinforced and more deeply learned. You’ll enjoy seeing your game continue to improve. Bottom Line:Year in and year out we see Heartland opening new levels of play to men and women of all ages across the spectrum of physical ability. The skills that you will experience and learn, produce a swing that is simpler to manage and one that can be made more consistently. and providing the player with ample supervised practice for the player to confirm that they understand correctly and that what they understand works for them. The content of our instruction is derived directly from golf’s primary objective of sending a ball to a target (e.g. the middle of the fairway, the middle of the green, or the hole) by striking it with a golf club and the fact that the flight of the golf ball is a reaction solely to the action of the golf club. We call our instruction “Club-Focused Instruction”. Club-focused instruction is an approach that deals with the correct movements of the golf club necessary to propel the ball towards a specific target. This approach is based on the fact that the golf ball is an inanimate object and can only move when it receives energy from another object and can only move in the direction of the energy from that other object. A soccer ball will rest forever on the soccer field until a player’s foot imparts energy to it. When the soccer ball moves it can only move in the direction that the foot was moving. Since golf is a game of sending the ball to a target, the golfer’s focus must likewise be on moving the club in the direction of the target. The movement of the ball is solely a response to the movement of the club. The movement of the ball in a highly defined manner requires the movement of the club in a highly defined manner. Identifying the manner of the club’s movement is the basis for the principles on which club-focused instruction is based. Do you use video for instruction? Video is an excellent tool for viewing a golf swing. Slow motion allows our eyes to see the many motions made by the body and by the club. For golfers who want to study these motions, video is invaluable. As helpful as video is for viewing, it can be equally counterproductive. Using video for its analysis of mechanics of the swing puts us on the long, tedious, overwhelming path of learning to manage all of the body and club motions occurring in a swing, rather than on the direct path to learning to produce the swing of which all the motions are symptomatic. Learning to produce the swing is the focus at Heartland. If you have ever watched a video, you will note how difficult it is to predict the exact ball flight related to each swing. If you don’t know the ball flight the swing produces, it is dangerous to attempt to mimic a given swing. At Heartland, you will learn to observe your ball flight and use this information to learn about the swing that produced it. Rather than plodding through the delay of shooting, rewinding, and playing, learning ball flight allows you to be promptly reactive both in practice and play. Finally, learning from video is problematic because a player seldom has video when they are practicing or playing, whereas ball flight is immediately available. What about lessons longer than three days? Our experience is that three days begins to push the limits of the amount of material a player can assimilate. Our 3-day curriculum is based on our experience of player’s learning curves. Benefits of school are not related to how much you have been taught but instead how much you have learned. Learning happens in stages: the first stage is when you understand; the second stage is when you can do; the third stage is when you can instinctively do. Bottom Line: Sessions are geared to learning. Working together, we will find that in the course of the three days you will learn how your swing can be improved from tee to green. I'm a beginner, is golf school right for me? Routinely, our experienced players tell us, “I wish I had done this [attended Heartland] when I first started playing.” Anytime we have new players in class, those experienced players tell them, ” You’re doing it right.” With 20/20 hindsight they can clearly see how their practice and playing time could have been so much more enjoyable. Players who are new to the game report that they were surprised how quickly they felt comfortable with the other golfers in their class. They were also enthused to find that they were already making progress the very first morning. With a curriculum based on years of refinement, players who are new to the game will find their time at Heartland to be the most productive way to invest their time for learning. Our maximum class size of four players allows us to work with each player individually at their own level. We appreciate the opportunity to be the first to introduce new players to this wonderful game. Bottom Line: Our one-on-one instruction and comprehensive curriculum is an effective and organized way for new players to get into golf. I'm a low handicapper, how will I benefit from Heartland? First, congratulations if you have a low handicap. You are among a very small percentage of golfers. Having a low handicap means that you send the golf ball where you want a high percentage of the time. You are proficient and consistent. Improvement for you means elevating your proficiency and consistency. For less-skilled golfers, the errors they make are bigger and more frequent. For you, improvement requires a systematic and conscientious assessment to identify and prioritize opportunities. Heartland’s tee-to-green curriculum provides a structure for just such an assessment. Implementation of the improvements requires practice with one-on-one supervision, which is why we limit our class size to just four players. During your three days at Heartland, together we will arrive at a mutual understanding of the current state of your putting, chipping, pitching, irons, and woods. Then we will identify improvements that will make sense and that you will experience producing obvious improvement. Most rain is in the form of cells moved along by winds. In the event of rain, we do exactly what you would do if you were playing golf. If a day brings a light mist or momentary sprinkle, and you were playing golf you would continue to play–we will continue to practice. In the event of a more prolonged period while you were playing golf, you would go indoors till it passes–we will go indoors and engage in a portion of our classroom curriculum till it passes. What about attending school in the late summer or fall? Late summer or fall is an excellent opportunity to attend golf school. The weather has moderated, fall colors decorate the outdoors, and there are many weeks that follow for you to practice your improved abilities. What about husbands and wives attending together? There are several factors that can make golf school even more effective. Often, one of those is attending with a partner with whom you watch, practice, or play golf. Your time at Heartland will not only improve your games, it will put both of you “on the same page.” Your shared understanding of the golf swing will not only make golf conversations more interesting, it will also allow each of you to better understand what and how each of you are improving your game. When you hit good shots or “other shots” you and your partner will be in concert as to what happened. Sometimes partners are not of comparable skill levels. That’s not a problem. We keep the class size limited to just four players so that we provide individualized instruction specific to each player. Partners are in the class together, but they work individually. Their instruction and practice are personalized for them. In addition to better understanding and better shots, your time at Heartland will be so enjoyable that many couples describe it as feeling like a vacation. Are there hotel accomadations available? Some players enjoy the ambiance of the city with its diverse restaurants, casinos and night life. The course is 25 minutes south of downtown St. Louis and its many hotels. I WOULD LIKE A MAP AND DIRECTIONS.